Forecasters often convey their opinions about the direction stocks are headed by establishing a point estimate as to where a major index will be on a specific date in the future. These predictions frequently turn out to be wrong, and do little to help investors understand the nature of risk in the environment. When formulating our market outlook the goal is not to predict with specificity what index returns will be over a given period of time. Rather, we want to understand the likelihood of potential return regimes to aid in our active approach to risk management over the course of a market cycle. We want to understand the balance between risk and reward in the market and then provide a more general sense of what returns might look like. More specifically, our framework seeks to gauge the risk of a sustained loss of capital (i.e., a bear market) as well as the likelihood of strong, above average market returns over the intermediate term. We develop our expectations of future market performance through close monitoring of the three major factors that influence stock prices: economic activity, valuations, and sentiment. Within each category there are many individual indicators and data points we scrutinize. The extent to which evidence of extremes exists in these indicators is of the utmost importance. Excesses are unsustainable in the long-run and we want to be prepared for trend reversals and the risks and opportunities that come with them. Markets tend to be at an elevated risk of a bear market when economic indicators are overheating, valuations are expensive, and sentiment becomes speculative or overly optimistic. In contrast, markets are typically low risk and offer the most compelling future return prospects when there are distinct signs of pain in the economy, attractive valuations, and a very pessimistic investor base. Today, we find ourselves in an environment with few extremes across these factors. The economy is growing, albeit slowly, valuations are not overly expensive, but certainly not cheap, and sentiment is neither excessively bearish nor bullish. That being said, we are beginning to see subtle indications that potential concerns may be building on the horizon. While we think it is still too early to begin preparing for the next economic downturn, we also see a fairly high likelihood that new bouts of market volatility could develop going forward, and because of this, flexibility in portfolio positioning is paramount. As we will discuss, we see volatility as an opportunity investors should be ready to take advantage of. Typically, signs of a looming recession arrive as economic conditions become overheated. The Federal Reserve responds by hiking interest rates which discourages risk taking and activity begins to slow. The Treasury yield curve inverts as yields on the short-end rise above those of longer dated bonds. Ideally, these events help cool things down and remove excesses in the economy, making way for the beginning of a new cycle of economic growth. Digging into economic conditions today reveals that none of these things are taking place. Economic growth is certainly not coming to a boil as output continues expanding at a modest pace and inflationary pressures are largely absent in the headline numbers. Slack in the labor market has kept a lid on growth in wages and salaries thus far resulting in muted consumer spending. Meanwhile, businesses are hugely profitable, but many remain reticent to spend and invest in capital projects given the weak macroeconomic atmosphere. Despite the lack of obvious extremes in the economy, we are seeing some nascent precursors to overheating that need to be monitored. For example, steady progress in labor markets during the past few years has slowly improved workers’ ability to obtain higher wages from employers. Distinct evidence of this is not apparent in aggregate wage growth metrics just yet, however, employers in industries such as manufacturing and construction are expressing greater difficulty in finding qualified candidates to fill open positions. 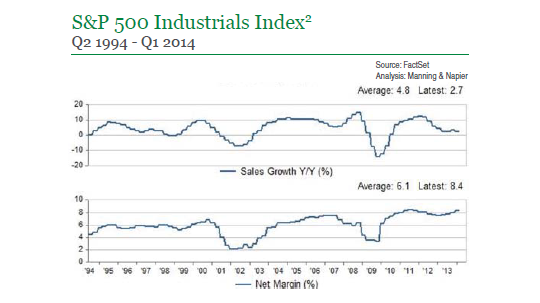 We highlighted this trend in a recent Outlook Series piece, Revisiting the U.S. Manufacturing Renaissance. Indications of a firmer labor market can also be seen in recent JOLTS data. 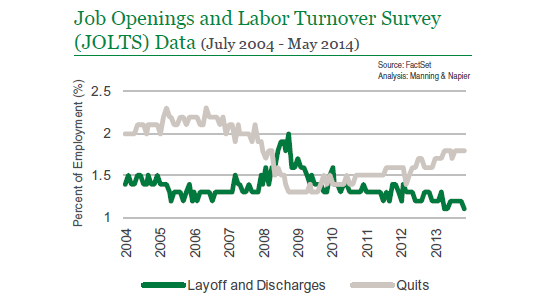 Layoffs continue to decline and hit new lows whereas the quits rate is rising. A rising quit rate is associated with a healthier employment environment and underlying economy as workers take advantage of an improving labor market and seek out more attractive employment opportunities. To the extent that other signs of a tighter labor market begin to crop-up across industries and sectors, faster growth in wages and salaries could follow close behind. Loan growth is another area that deserves careful monitoring for signs of excess going forward. Commercial and industrial (C&I) lending during this economic cycle has been on par with past recoveries, whereas most other loan categories have experienced much slower growth. More recently, the tide seems to be shifting. 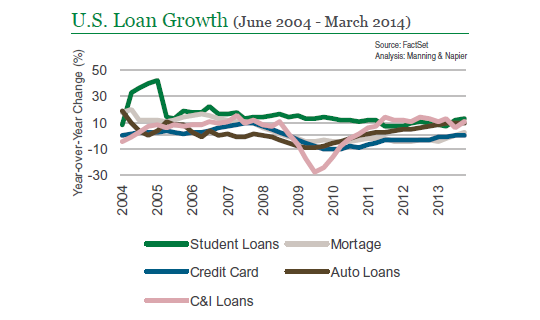 Data covering early 2014 shows that loan growth is picking up outside the C&I arena. Mortgage loan growth finally turned positive on year over year basis and annual growth in auto loans has been near 10%. A general loosening in credit standards, coupled with more robust demand for credit, suggest that these trends could persist. Although the pace of loan growth is not sounding alarm bells today, the fact that monetary policy still remains ultra accommodative, means that this could change in short order. Of greater concern than the above at present is the general complacency we see with respect to inflation expectations, as well as assumptions that weak economic growth during the first quarter was entirely weather-induced. Consensus is very clustered on one side of both issues; 1) that inflation will remain slow for the foreseeable future, and 2) that economic growth will bounce back from the cold winter during the back half of the year. This type of herd mentality might spur market volatility if incoming data runs counter to either forecast. The sentiment spectrum is bookended by the extremes of fear (pessimism) and greed (speculation). The presence of unsustainable extremes in sentiment typically signals opportunities for contrarian investment positioning. Measures of sentiment that we track include IPO activity, investor surveys, mutual fund flows and market derived indicators such as the VIX. Pockets of speculation emerged earlier in the year in select hyper growth “story stocks” and certain biotech IPOs, but these appear to be isolated incidents far from the excesses of either the tech bubble of the late 90s or the housing boom of the last decade. In fact there are signs that these extremes have dissipated nearly as quickly as they appeared. 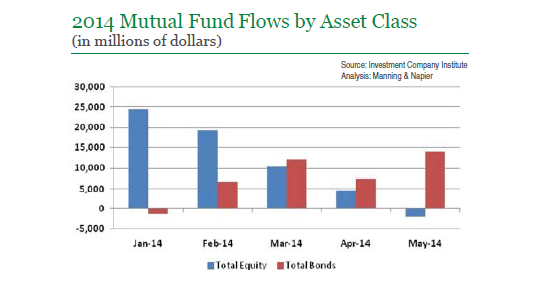 Furthermore, despite last year’s strong stock market returns, bond mutual fund flows actually outpaced equity mutual fund flows three months in a row earlier this year. To us, here too the bigger worry is complacency. The extent to which investors appear generally unconcerned with the risk side of the equation is troubling. 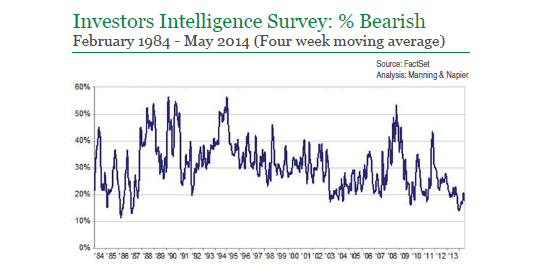 For example, the Investors Intelligence survey reveals that very recently investor pessimism was not far from 30 year lows and this measure of investor skepticism remains low today. Akin to consensus’ complacency in inflation and economic growth expectations, today’s market tranquility as represented by measures such as the VIX can be quickly replaced by fear and pessimism if indicator data or performance falls short of forecasts. The 2013 equity market rally was largely the result of multiple expansion. 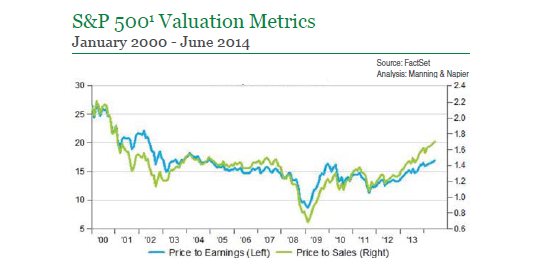 Valuations rose to the point where stocks now generally appear to be fairly valued or perhaps slightly expensive depending on the metric in question. Barring further multiple expansion pushing equities deeper into overvalued territory, our base case is for returns in the broad market to at best largely mirror earnings growth. Growth at the corporate bottom line (i.e., earnings) is a function of sales growth and profit margins. This means that in order to assign a meaningful probability to the likelihood of a reacceleration in earnings growth, we would need to foresee a decent step-up in economic growth to propel revenues and/or even wider profit margins. Broadly speaking, with the revenue growth opportunity in a market index closely tied to a slowly growing economy, better earnings growth would need to come through higher profit margins. This, too, seems unlikely as there are only so many levers businesses can pull to reduce expenses and boost net income and many of these options have been exhausted. For example, lower taxes and less interest expense due to low interest rates helped profits during recent years, as have restrained wage growth and hiring. We do not see a strong reason why these items will get even better going forward. Indeed, gradual improvement in the labor market should be a headwind to margins as slack diminishes and upward wage pressures build. At the individual company and industry level, some businesses will be able to expand margins, but in most cases profitability has reached new highs and further improvement is likely to be more of a challenge. The good news is that while we do not see a strong argument for further margin expansion, we think it is equally unlikely that margins will suddenly collapse. As it pertains to economic growth, if labor markets continue tightening and income growth accelerates, the boon to consumer spending might fuel a pick-up in the economy such that valuations of the broad market today would seem more reasonable. Businesses deciding to begin spending their large cash piles could also be a catalyst for quicker economic growth. Either scenario would have advantageous revenue growth implications for companies in general. We need to monitor for developments like this because they represent counter arguments to our slow growth outlook. So far the evidence for economic acceleration is too sparse to change our expectations. The opportunities to meaningfully over or underweight stocks are most compelling when conditions are at extremes. The absence of extremes on economic, sentiment, and valuation fronts at present places the market in somewhat of a no man’s land. That being said, the weight of evidence suggests that expectations should be for modest equity market returns in the near future. Complacency is concerning, particularly signs that investors have become accustomed to the less volatile atmosphere of early 2014. In a market where most investors have similar opinions about the economy and financial markets, we see elevated risk that the calmness could disappear rather quickly. However, the current state of our indicators suggests a deep and lasting correction in stocks is a relatively low probability event today. It is important to closely monitor the economic, valuation and sentiment landscapes for signs that the balance of risk reward is changing and to have the flexibility to adjust ones portfolio accordingly. 1The S&P 500 Total Return Index (S&P 500) is an unmanaged, capitalization-weighted measure of 500 widely held common stocks listed on the New York Stock Exchange, American Stock Exchange, and the Over-the-Counter market. The Index returns assume daily reinvestment of dividends and do not reflect any fees or expenses. Index returns provided by Bloomberg. S&P Dow Jones Indices LLC, a subsidiary of the McGraw Hill Financial, Inc., is the publisher of various index based data products and services and has licensed certain of its products and services for use by Manning & Napier. All such content Copyright © 2014 by S&P Dow Jones Indices LLC and/or its affiliates. All rights reserved. Neither S&P Dow Jones Indices LLC, Dow Jones Trademark Holdings LLC, their affiliates nor their third party licensors make any representation or warranty, express or implied, as to the ability of any index to accurately represent the asset class or market sector that it purports to represent and none of these parties shall have any liability for any errors, omissions, or interruptions of any index or the data included therein. 2S&P Industrial’s (S&P 500 Industrials Index) data is extracted from the S&P 500 Total Return Index, excluding the Financial, Utilities, and Transportation sectors. Sources: FactSet, IFG Pensions, Investments, & Advisory Services, Investment Company Institute.